It's Saturday! I hope everyone is enjoying the weekend, I'm probably off at Target chasing my kids down the aisles. Fun. But, gosh, I love them so much -- if only they weren't so crazy! Smitten will be available for purchase on January 15th. Smitten comes in a 4x6 clear acetate sheet and will retail for $15.00. Smitten contains a total of 12 stamps: 10 sentiment stamps and 2 images. The circle stamp measures 1-7/16" and works perfectly with a 1-1/2" circle punch; the feather measures 11/16" x 1-7/8"; the All You Need is Love Love Love stamp measures 13/16" x 2-3/8"; the small circle stamp measures just under 3/4". I'm having a gold rush lately. I snap up any and all crafty products that are gold. 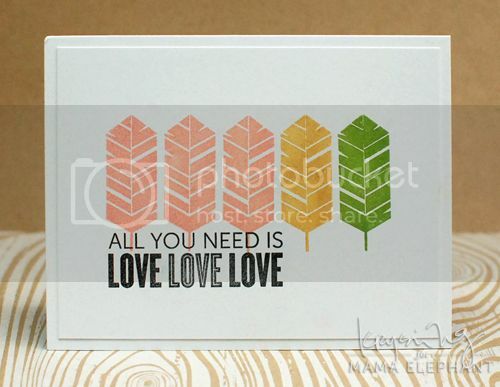 Here's my card featuring the feather stamp you'll find in Smitten. Isn't she pretty?! I've been using ink from Fresh Ink almost exclusively, with the exception of the colors black and white. I find that Fresh Inks work really well with not just our stamps, but all clear stamps. They give a nice even coverage without being splotchy. So, you like what you see? I've got another First Look tomorrow. See ya! i love the feathers!! and your use of gold! :) how wonderful! You guys have done it again! So impressed with this set so far and can't wait to see more! Kryssi, I LOVE this feather stamp!!! Great design!